Paul Joseph Nelson, who died at Souderton Mennonite Home in Pennsylvania, last Thursday [13 September 2018], spent many years in Dublin in the late 1970s and throughout the 1980s. Paul’s wife, Dawn Ruth Nelson, died last year, on 21 August 2017. 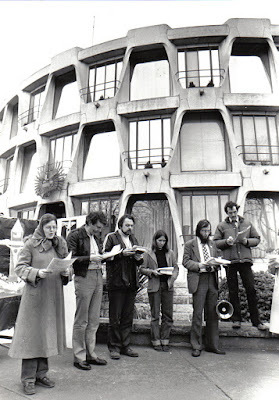 During their time in Dublin, I shared many activities with Paul and Dawn, including protests organised by Christian CND, conferences organised by the Student Christian Movement, and editorial workshops on a nonviolence journal called Dawn – the name was truly a coincidence – which was produced in the SCM House in Dublin, then at 168 Rathgar Road. Paul was born in Iowa City on 23 April 1951. At the time, his parents – Boyd H and Welma B (Graber) Nelson – were living in Wayland, Iowa. The family moved to Elkhart, Indiana, in 1952. Paul was baptised in Prairie Street Mennonite Church in 1964. As a child and a teenager, Paul was intellectually curious, adept at math and science, and designed things such as a unicycle, a skateboard and a banjo. Paul graduated from Bethany Christian High School in Goshen in 1969, and from Goshen College in 1973 with a degree in chemistry. In the mid-1970s, he was part of Assembly Mennonite Church (Goshen), took classes at Associated (now Anabaptist) Mennonite Biblical Seminary (Elkhart), and for a time was director of the Elkhart County Home. Paul and Dawn were the first of a group of US Mennonites who came to Dublin in autumn 1979. There they were part of the Mennonite mission and peace witness team to support an Irish Mennonite, Mike Garde. They were sponsored by the Mennonite Board of Missions and the Mennonite Central Committee and the community shared a large house in inner-city Ballybough, close to Summerhill and Croke Park, where I was often a welcome guest. In Dublin, Paul returned to graduate studies at Trinity College Dublin, and earned a master’s degree in mechanical engineering. Paul and his friend Graham Corcoran then established Phoenix Cycles, which operated for several years in a workshop near TCD. This was an effort to be self-supporting and to provide jobs at a time of high unemployment in Ireland. I bought one of those Phoenix bikes around 1984 – I remember it was lightweight, green and had ten gears – and while I was studying for my BD I used it for a year to cycle from Firhouse to Kimmage Manor for lectures each morning, before heading on into work in The Irish Times. Eventually, cycling home from work in the late evening in Dublin became a hair-raising if not life-threating experience, with potholes big enough to be craters but invisible in the dark, and late-night drunks driving home from the pub. I passed Paul’s bike onto another friend, but still remember its pioneering qualities. Paul and Dawn returned to the US with their three children in 1991, moving to Harleysville, Pennsylvania, near Dawn’s family home. He worked as information technology manager in Hatfield, where he worked for 20 years, making the 12-mile round-trip to work on his bicycle in all kinds of weather. I wonder whether it was based on his Phoenix prototype, and whether he remembered my scary stories about the bike he had sold me. 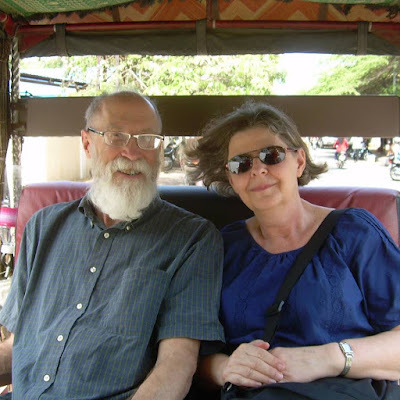 Paul and Dawn were part of Salford Mennonite Church, Harleysville, then Methacton Mennonite Church, Eagleville, where Dawn served as pastor for 11 years until 2014, and Plains Mennonite Church, Hatfield. They were part of Bridgefolk, a movement of sacramentally-minded Mennonites and peace-minded Roman Catholics who come together to celebrate each other’s traditions and explore each other’s practices. Paul was diagnosed with progressive supranuclear palsy, a form of frontotemporal dementia, late in 2014. For some time, he continued to volunteer several mornings a week at the Mennonite Central Committee Material Resource Centre in Harleysville. Paul shared Dawn’s interest in Christian formation, and he enjoyed classes and retreats, and the conversation and companionship of Barry’s Boys, a men’s group that provided support as Paul’s health declined. He moved from the cottage he had shared with Dawn at Souderton Mennonite Home into Park View and then into nursing care. He continued to take pleasure in frequent visits from his children, listening to audio books, and following English Premier League soccer and the Philadelphia Phillies and Eagles. Dawn continued to write after their return to America. We kept in touch occasionally, and we were sorry to miss each other during her last visit to Ireland. Throughout his life, Paul’s deep commitments, his fundamental decency, and his dry wit endeared him to his family and his friends. In keeping with his generosity of spirit, Paul has donated his brain to the University of Pennsylvania Medical Centre in the hope that study of his brain can contribute to understanding and effective treatment of the brain disorder that took his life. He is survived by his children – Sarah Ruth, Peter Levi (Emily Bender), and Benjamin Henry Paul Nelson – and by an older brother, Benjamin H (Susan Gardner) Nelson, and a younger sister, Barbara (James) Nelson Gingerich. A memorial service takes place in Plains Mennonite Church, Hatfield, at 3 p.m. on Sunday 23 September. What a beautiful memorial tribute and celebration of a life well lived, Patrick. Thank you for blogging about Paul and those memories of Dublin in the eighties when he and his family lived here. Really enjoyed reading about this special man. Dear Friends - May they rest in peace. He was a very good engineer we never had a problem with our bikes I will miss him Graham Corcoran.